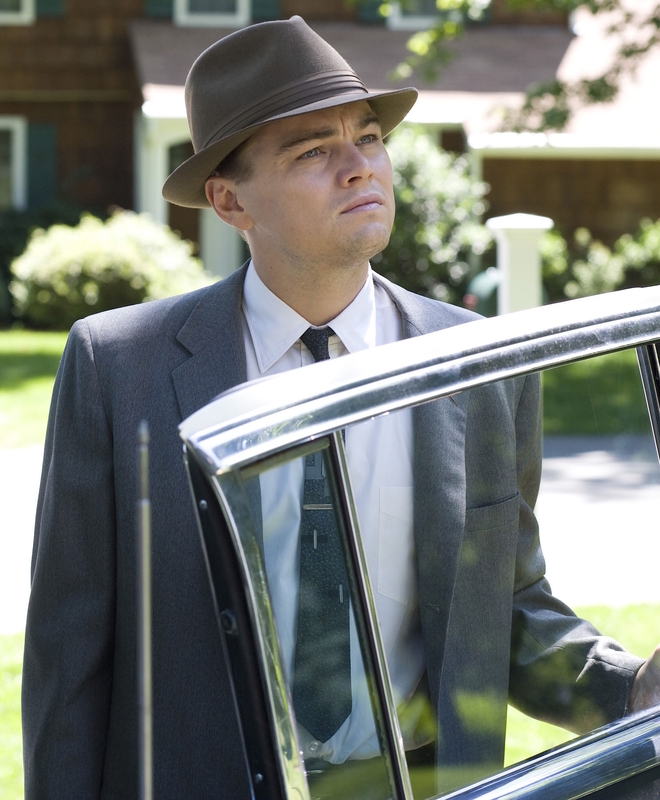 As today is Leo’s actual birthday, I’m exploring the suit he wore for his character Frank Wheeler’s on-screen birthday in Revolutionary Road, the cinematic adaptation of Richard Yates’ 1961 novel that re-paired DiCaprio with Kate Winslet more than two decades after their iceberg-melting chemistry in James Cameron’s Titanic. Unfortunately for Kate and Leo, the Wheelers are far less passionate than the star-crossed Jack and Rose. As the couple approaches seven years together, neither is feeling particularly fulfilled in their sanitized suburban life. Per Sloan Wilson’s seminal 1955 novel that lent its title to the trope, Frank Wheeler rides into work as the archetypal “man in the gray flannel suit,” the discontented businessman who spends his life traveling between suburbs and skyscrapers with nary an opportunity to address the artistic promises of his youth. Thus, Frank is neatly attired in the standard gray wool business suit that could be found in any American businessman’s closet during the Jet Age. The cut is boxy without being unflattering, the jacket shoulders are padded and wide, and the narrow notch lapels roll to a two-button front. His jacket also has a welted breast pocket, straight flapped hip pockets, three buttons on each cuff, and a short single vent in the back. The trousers have a higher rise than is fashionable today but still rise to just below his natural waist. The full cut echoes the jacket with additional roominess provided with the double reverse pleats on each side. The trousers have straight pockets along each side seam, no back pockets, and turn-ups (cuffs) at the bottoms. Through the short belt loops, Frank wears a slim black cowhide belt with a small gold-toned single-prong buckle. Frank’s dress shirt is the standard white poplin “businessman’s special” that Don Draper kept a backup stash of in his office drawer. Frank’s shirt has a spread collar, plain front, breast pocket, and simple button cuffs, just like a modern man could easily find on the shelves at Macy’s. Frank’s dark blue tie is full of fifties fun with its abstract Saul Bass-like print of two thick gray squares colliding in the center, a field of light gray dots, and a series of white vertical brush strokes. He wears the tie clipped into place with a plain silver tie bar fastened high on his chest above the third button of his shirt. Frank reties his tie a little longer following his tryst with Maureen, as the tie bar now intersects with the top of the two squares rather than resting just under them. Visible through the lightweight cotton of Frank’s dress shirt is the outline of his white ribbed sleeveless “A-shirt” undershirt. Frank’s shoes are dark brown leather derbies (a mismatch with his black leather belt!) that appear to be worn with black socks. I’m happy with the broader strokes—for instance, the people going to work—all the men in suits and hats. Every single person back then did not wear a hat, but most people did. And I pushed it. I had everybody in hats and suits and ties. It created an atmosphere for Leo DiCaprio’s character to disappear in this crowd. Many times you can’t even find him because he looks like everybody else. And I thought that was very successful. Rather than the traditional grosgrain band as worn by his fellow commuters, Frank’s trilby has a thick brown fabric triple-ribbed band. Frank takes his place among the other men in their business uniforms of two-piece suits, white shirts and ties, and fedoras. The practice of men wearing wedding rings became most popular around the 1950s, and our married protagonist wears his plain gold wedding band on the third finger of his left hand. On the same hand, Frank wears his everyday wristwatch, a steel timepiece with a round case and a white dial on a black-filled bracelet. Every element of the outfit, from the hat and shoes to the design of the tie, can be found in costume designer Albert Wolsky’s original concept sketches for the character. 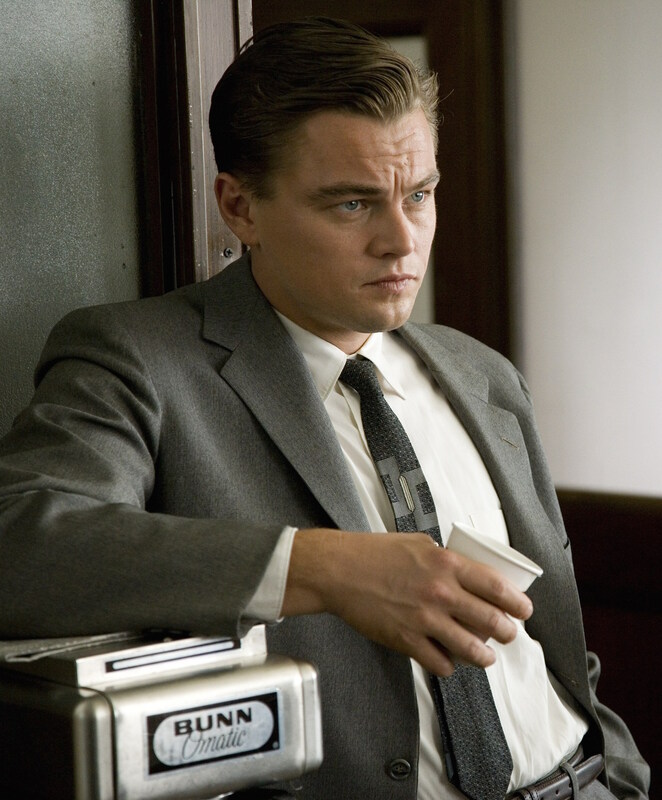 Wolsky was nominated for an Academy Award for his Revolutionary Road costume design. 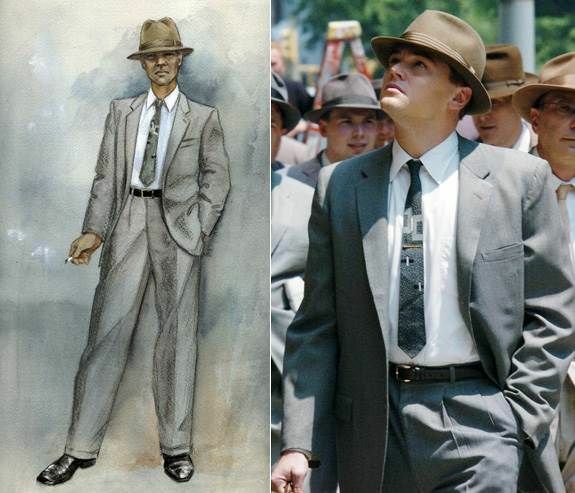 From sketch to screen… Albert Wolsky’s costume design brought Frank Wheeler to life. Frank commemorates his birthday during the work day with that most celebrated of mid-century office traditions, the “three martini lunch”. A self-satisfied Frank gets drunk on martinis with Maureen Grube (Zoe Kazan) during his birthday lunch. He immediately follows it up with one of the era’s more shameful practices, skipping the rest of the workday for an adulterous affair with his secretary. Frank Wheeler makes the ideal image of the quintessential young American businessman as he heads off to work on his 30th birthday.